Buy your entry tickets now for the Reina Sofía National Museum of Art and on the day of your visit, you will be able to "skip the queues" with your priority access. Let yourself be amazed by the beauty of the works belonging to world famous artists such as Picasso, Dalí and Miró, all housed together in an exceptional setting. In the 1700's, the building was actually a hospital which has now become one of the most prestigious museums of modern contemporary art in the world. We recommend that you purchase your entry tickets in advance. 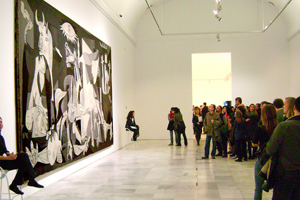 The Reina Sofía National Art Centre is one of the world's most famous museums of contemporary and modern art. The building was originally a hospital in the 18th century that was subsequently restructured and converted into a museum in 1992. Insert the time at which you would like your visit to start (at 30 minute intervals) and click on the button "Book Now." On the day of your visit, just show your entry tickets on your smartphone at the entrance to the Reina Sofía Museum. The Reina Sofia Museum is open every day except Tuesdays.